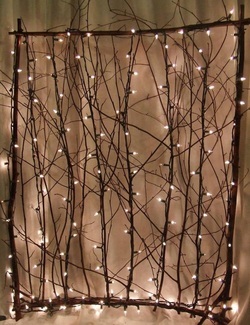 Lighted twig screen has multiple uses by day and by night. You will need to collect some twigs and sticks then lay them out to weave together on a frame built of sticks. Personal patterns and tastes will emerge as the twigs will seek their own balance. Home stretch anchor some lights and plug in while in use.